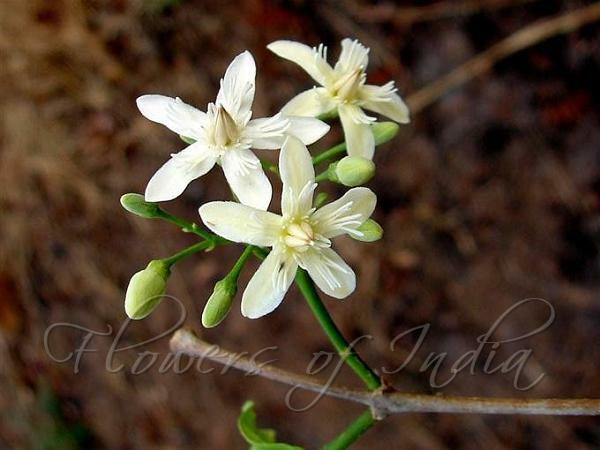 Sweet Indrajao is a small, deciduous tree with a light gray, scaly smooth bark. 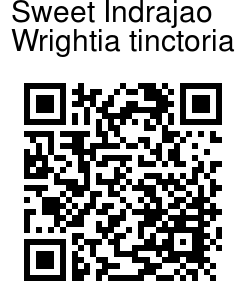 Native to India and Burma, Wrightia is named after a Scottish physician and botanist William Wright (1740 - 1827). From a distance, the white flowers may appear like snow flakes on a tree. The fruits pendulous, long paired follicles joined at their tips. The hairy seeds are released as the fruit dehisces. The leaves of this tree yield a blue dye called Pala Indigo. Sweet Indrajao is called dhudi (Hindi) because of its preservative nature. Supposedly a few drops of its sap in milk prevent curdling and enhance its shelf life, without the need to refrigerate. The wood of Sweet Indrajao is extensively used for all classes of turnery. It is made into cups, plates, combs, pen holders, pencils and bed stead legs. It is commonly used for making Chennapatna toys. Medicinal uses: The leaves are applied as a poultice for mumps and herpes and sometimes, they are also munched to relieve toothache. In folk medicine, the dried and powdered roots of Wrightia along with Phyllanthus amarus (keezhanelli) and Vitex negundo (nochi) is mixed with milk and orally administered to women for improving fertility. The bark and seeds are effective against psoriasis and non-specific dermatitis. It has anti-inflammatory and anti-dandruff properties and hence is used in hair oil preparations. Photographed in Maharashtra & Delhi.